University of North Texas Press, 9781574411713, 176pp. Bilingual education is one of the most contentious and misunderstood educational programs in the country. It raises significant questions about this country’s national identity, the nature of federalism, power, ethnicity, and pedagogy. 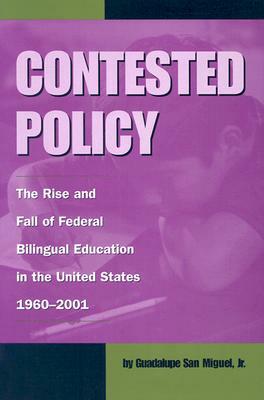 In Contested Policy, Guadalupe San Miguel Jr. studies the origins, evolution, and consequences of federal bilingual education policy from 1960 to 2001, with particular attention to the activist years after 1978, when bilingual policy was heatedly contested. Guadalupe San Miguel Jr . is professor of history at the University of Houston. He is the author of “Let All of Them Take Heed”: Mexican-Americans and the Campaign for Educational Equality in Texas, 1910–1981, Brown, Not White: School Integration and the Chicano Movement in Houston, and Tejano Proud: Tex-Mex Music in the Twentieth Century.